Were you looking for a picture of the Vanilla Blueberry Butter Cake that I posted this weekend? Here it is! This cake is super moist. So much so, it crumbles when you cut it. hey,,i love all your recipes… can i use this same batter for muffins? Thanks! I don’t see why you couldn’t use this batter in muffin tins. My suggestion, make one or two muffins and see how they turn out before making the whole batch. If you aren’t happy with them, then finish using the batter in a cake pan. You could also make one muffin using a paper liner and one without to see what kind of difference that makes too. Good luck! This cake looks so scrumptious! 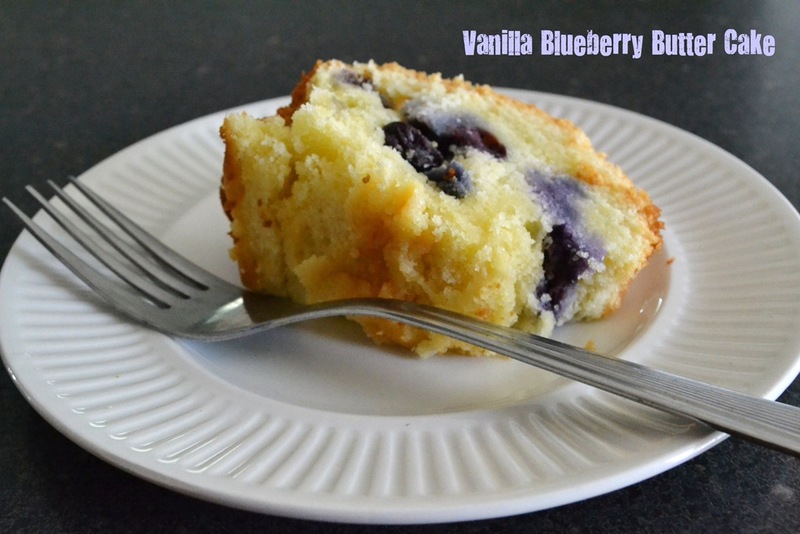 Blueberries create delicious bursts of flavor while the vanilla provides a heavenly aroma…I want a piece! I love the burst of flavor the blueberries added to this cake. Thanks for dropping by Amy! Oh my gosh this looks incredible!! Now, would be the perfect time for a slice.